I wonder if "leadership opportunities outside of Marquette" means a football school is finally giving him a chance. Haha. The O has the story already. I thought to myself -- Well, at least UP will get mentioned by the paper this week. There have now been at least five key people at Marquette "resign" in the last six or seven months, including the university president this last September. Sounds like a purge to me. The other Williams is doing just fine there. He has a multi year rolling contract. I though I'd take a peek over at MUscoops and see what they are saying. Pretty interesting. Apparently Buzz Williams is the tail wagging the dog. It seems Larry Williams' biggest faults were calling out the basketball coach's poor behavior, raising academic standards for students athletes (i.e. basketball players), making athletes (basketball players) live with other students, and mispronouncing someone's name. Oh, and having a Notre Dame degree and experience. I can see why they'd want him out of there. Just to give you a heads up, after alienating Marquette alumni and our head coach for two years, Larry Williams "resigned" as Athletic Director yesterday. You can have him back if you wish. In over his head at Marquette! It appears your head coach and his Billionaire backer can hire and fire Presidents, provosts, and AD,s when they get in the way of his ignoring pesky things like NCAA violations. And I see he has hired back all the old guard that put him there. Good luck down the road. As a heads up right back, I suspect you will need it. PurpleGeezer wrote: It appears your head coach and his Billionaire backer can hire and fire Presidents, provosts, and AD,s when they get in the way of his ignoring pesky things like NCAA violations. Good one, but wrong guess. Larry was outmatched! Not really a guess. Get back to us in two years. What does that mean??? If you have information, then share it. Otherwise, it's just innuendo that seems unsupported by facts. I went to the muscoop site that Geezer recommended, just to see what they were saying. I am curious as to why so many of them think of their school athletic department as "big time" and seem to think UP is not. At least based on their comments about LW that is what they seem to think. As far as I know they have 1 NCAA championship (and that was over 35 years ago), to UP's 2 in the last 11 years. Their Men's Basketball program which seems to be their premier sport, in 33 years of the Big East Tournament has never won nor even been runner up. Anyone have any concrete reasons as to what this superiority complex might be based on? A_Fan wrote: I went to the muscoop site that Geezer recommended, just to see what they were saying. I am curious as to why so many of them think of their school athletic department as "big time" and seem to think UP is not. At least based on their comments about LW that is what they seem to think. As far as I know they have 1 NCAA championship (and that was over 35 years ago), to UP's 2 in the last 11 years. Their Men's Basketball program which seems to be their premier sport, in 33 years of the Big East Tournament has never won nor even been runner up. Anyone have any concrete reasons as to what this superiority complex might be based on? They "think" MU is "big time" because it is, at least among schools that don't have football. First off their one title was in men's basketball, the biggest NCAA tournament of all, and more people will be aware of that than will probably ever realize Portland won two Women's College Cups. No, they haven't won the Big East, but that was one of the premier basketball conferences even before it got broken up and reorganized, and still is today. They were, and still are, on national TV regularly, and that type of exposure means a great deal. Besides, in the major conferences like the Big East will get multiple bids, so winning the conference isn't as important as making a deep NCAA run. When almost every college basketball fan looks at Marquette's recent results they're going to be impressed with their two Sweet 16s and one Elite 8 the last three seasons. Almost nobody will even look at where they finished in the regular season or conference tournament. Let's move away from just basketball. Looking at money, which like it or not is what drives Division I sports, Marquette spent about $26.5 million on athletics overall in 2012, and almost $10 million on men's basketball. The only WCC school that spends more overall is BYU at $48M, and they have an FBS football team. As far as men's basketball spending, not even Gonzaga ($6.1M) comes close to Marquette. Portland's numbers, by comparison, are $12.2M overall and $2.1M on men's basketball, both 9th out of 10 WCC members. In conclusion, I'd place Marquette as a "bigger time" program than every WCC school save BYU and maybe Gonzaga. So spending rather that success makes a program "Big Time"? A_Fan wrote: So spending rather that success makes a program "Big Time"? They have been pretty successful. Compared to what? They see themselves as a premier program. They paid Buzz Williams $2.8 million two years ago. Another Williams(Roy) made $1.35 million the same year at UNC, and Syracuse's Jim Boeheim made $1.8 million with a lot more storied career to back up his paycheck. Tom Izzo made $1.73 million.Calhoun made 2.3 million. Despicable as he was, he at least got a championship. Buzz's teams haven't been exactly spotless. Those guys have at least one National Championship to command their salaries. I wouldn't even say he is as successful as Mark Few, who's best year is $1.056 million. Strange we didn't continue the is thread after Buzz Williams high-tailed it to Virginia Tech, of all places. Buzz Williams won a battle at Marquette and left. It was a battle that was brutal enough that scores were settled and Larry Williams was effectively kicked to the curb by an interim president while Buzz remained in place. IMO Buzz took one of the worst jobs in a league that features North Carolina, Duke and Syracuse and will add Louisville next season, while also featuring Virginia, N.C. State, Clemson and Georgia Tech, among others. Williams reportedly got a seven-year contract worth around $18 million, but leaves behind a rolling contract at Marquette that apparently would have been paying him in excess of $4 million within the next two seasons. He’ll probably be greeted like a conquering hero in Blacksburg because this is an unbelievable hire for Virginia Tech. The Hokies won 10 games combined in the ACC in the past three seasons, and now they've just hired a coach with a career winning percentage of .651. It's probably not surprising Buzz has moved on, but it does seem a surprise he ended up at Virginia Tech. I'd be curious to know what our Marquette friends think about Williams buzzing off. Where did Larry end up? DeanMurdoch wrote: Where did Larry end up? Larry hasn't ended up, yet! Because of the way he "resigned" at Marquette, he's apparently still being paid the remainder of his contract while looking for a suitable place to land that doesn't allow the boosters or coaches to run the show without regard for the rules. Here's a tidbit for you: it is rumored that Larry is a candidate for the open WCC Commissioner position. DoubleDipper wrote: Strange we didn't continue the is thread after Buzz Williams high-tailed it to Virginia Tech, of all places. I wonder what his record was against the ACC? Here is a story from a Milwaukee Journal guy who seems to have grasped the issues with Buzz leaving. 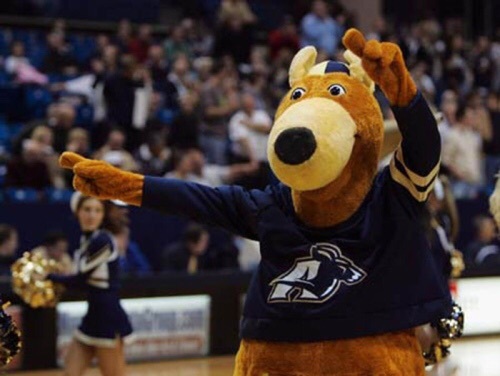 Former UP AD Larry Williams is the new AD at the University of Akron. While at UP, Larry brought the athletic department out of the dark ages into the 21st Century......and his good works have continued to grow under the guidance of AD Scott Leykam. Larry's contract at Akron will pay him $1.4 million over five years....that should take some of the sting out of his abrupt departure from Marquette. Larry wasn't much of a mascot guy. He's the fellow who put Wally on hiatus during his tenure. I can just imagine how he feels about Zippy the kangaroo. Did you know Zippy is female? I've never been close enough to see her pouch.